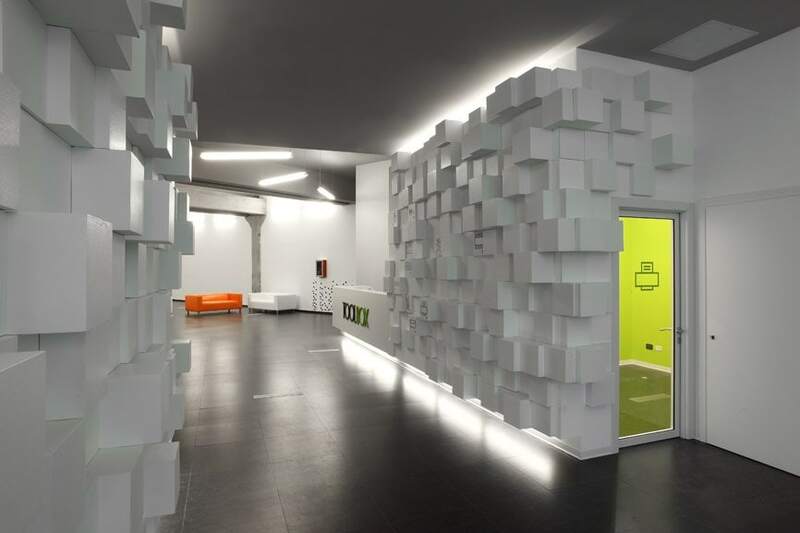 Toolbox is a professional incubator realised in an industrial building in the city of Torino. The project is believed to meet the needs of a city in a phase of substantial transformation. At a time when, with a laptop and a Wi-Fi connection, it is possible to work from anywhere, the question emerging is what professional space is needed for. How is it possible to design a space combining users’ plurality with the coherence of the whole design? How is it possible to mediate between a need for socialisation and privacy, between relaxation and concentration? From the functional point of view, the project consists in the creation of an open space with 44 individual workstations combined with other services and activities. The goal has been to keep the modular concrete structure unaltered. The main span of the building has been divided lengthwise by a series of ‘filter volumes’ used as technical spaces for storing lockers and equipment. On one side, there is the co-working space, on the other side, the corridors and the functional ‘box’ containing shared facilities such as meeting rooms, print rooms, informal meeting spaces, mailboxes, a patio and a kitchen. From the perspective of the design process the goal was to mediate between the plurality of users‘ needs and the coherence of the design. The concept of the project derives from the combinatorial Adaptable Component model developed by Caterina Tiazzoldi within the context of the research Lab NSU at the Politecnico di Torino and Columbia University. The variety of solutions is obtained by use of a unique design rule. A set of initially identical volumes acquire specialisation or differentiation through the use of different materials (cork, rubber, polished paint according to the programmatic function hosted in the box. The specialisation of a generic volume occurs in accordance with a specialisation generated by sound, thermal, and visual requirements. The goal was to convey a harmonious coexistence of different worlds and cultural references. 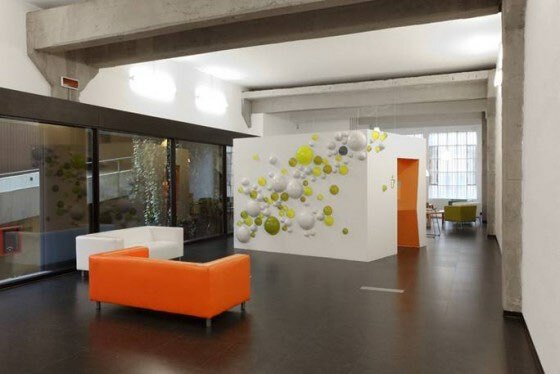 The principle of variation and transformation of a unique element was also pursued in other parts of the project by differentiating the colours of natural rubber floors in the meeting rooms, sound insulation coating alternating with small telephone pods and finally by varying the sizes, colours and levels of transparency of the bubbles that form the external texture of the box-bar. The concept uses a very few items in endless variations, a single system developing an infinite range of possibilities to respond to the plurality of users’ needs. This concept has driven every design choice. The walls of the entrance have been achieved with 500 variations of one single white box. The overall design was obtained with parametric software generating endless configurations from a single digital model. Similarly, conditioning grids have been obtained from a single parametric model that recalculates the size and position of the holes based on the exchange of air required in each environment. 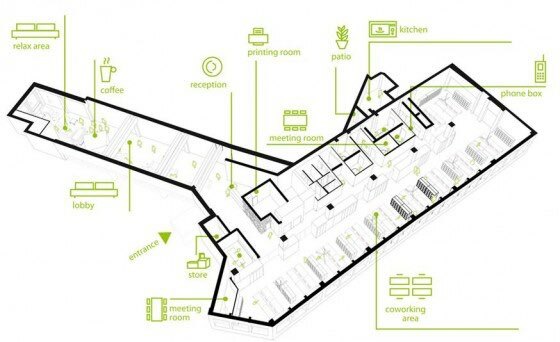 The same principle was also applied in the management of space oriented towards sustainable flexibility, a flexibility which is not based on the transformation of physical space but on a variety of uses obtained through the use of a few combinatorial functions (co-working, meeting rooms, kitchen, patio, parking). It is a flexibility permitting the derivation of an almost limitless number of scenarios. An automated system for centralised control of lighting, access, and services (printers, telephones) allows each user to have a profile designed according to their needs. The management of the space is therefore related to an automated system that allows or denies the use of certain functions in accordance with users‘ profiles. In this way the automated system allows us to reduce direct friction between people with regard to the modality of use of the space. Automation has become a tool of socialisation in a space in which interaction between users is very strong. Thanks to its unique features, Toolbox is an urban concept that draws its strength from the complexity, variety, and changeability of the contemporary city. Caterina Tiazzoldi – Nuova Ordentra is a design firm based in Torino (Italy) and New York (USA). experience in the professional practice. The focus of the work is to develop innovative urban and architectural organisms to respond to the complexity of today’s city. Through the research of Adaptable Components she engages the idea of architectural adaptation to different conditions: historical, conceptual, material, economical and cultural environments. Her work and methodology engage different design scales form products (Parametric Bookshelves, Napping Pod), Installations (Banana Installation and Onion Pinch), Interior and Architectural Design in the commercial field (Parametric Stalactites, Gb sportelli), professional spaces (Toolbox, I.O.S. office center) and healthcare clinics (Dental clinic Rossini). Caterina Tiazzoldi has been invited to participate to several international events and exhibits such as Torino World Design Capital, the Young Design Talent selection by Giulio Cappellini for the Temporary Museum for New Design, Advanced Architecture Biennal Settimo Tokio, Experiment Design Lisbon and the show Minimaousse at the museum Cité de l’Architecture et du Patrimoine in Paris. Her works have been published in international magazines (Domus, AMC Interieur, Interni, Metropolis, Elle Décor, Vanity Fair), National Newspaper (La Stampa, La Repubblica, Il Sole 24 ore), books (Shops 2009, ItaliArchitettura 4, Workspaces 2010 ) and scientific publications (ARCC Journal). She teaches as visiting professor at the New Academy of Fine Art (Milano) and European Institute of Design (Torino) and she lectured in several conferences and symposiums. Caterina Tiazzoldi won several awards (Nomination at the Cooper Hewitt Museum’s National Design Award, best paper EAAE/ARCC) and research grants (Sinapsi, Lagrange, Santa Fe Institute and Regione Piemonte Fellowship).